The perfect High Definition television for home offices, bedrooms, dorm rooms, kitchens and other small spaces, the new VX20L from VIZIO features an ultra-slim design that saves space without compromising quality. Its beautiful piano black bezel wraps around incredible widescreen HD functionality featuring 1366x768 high definition resolution, one HDMI input, RGB computer conection (great for use as a PC monitor), and 8ms response time. The new 20" VIZIO VX20L HDTV. Where Vision Meets Value. LCD Technology - The VIZIO VX20L has significantly less reflection and glare which makes this television ideal in any room lighting situations. High Definition Television - the VX20L offers HD formats and an integrated standard and high definition NTSC/ATSC/clear QAM digital tuner including 1080i and 720P. This will give you the full ability to enjoy the high definition content offered by your satellite and cable providers. 8ms Response Time - Vizio LCD HDTVs have super fast LCD response times which does not suffer from problems with image trailing and color distortion. 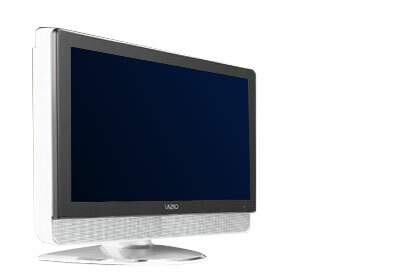 Designed for Maximum Versatility - VIZIO's VX-Series LCD HDTV's are equipped with a wide range of input and interfaces. From the first industry supported all digital AV interface, the HDMI connector, to the PC-input, and the YPbPr Connectors, we have it all. Just plug it in. Wall Mountable - VIZIO now offers the newest undercabinet mount for the greatest in mounting flexibility! Add the new VMC13-20 Under Cabinet mount today!